Tiny stone challenge took place from April 6th till May 9th 2015. The winners are John Metcalf and Christian Schmidt with 3 and 1 rank-1 entries respectively. Here is an archive of all final entries. Standard tiny hill specs apply: core size = max processes = 800, max cycles = 8000, max length = min distance = 20, P-Space allowed. Battles will be run in CoreWin with "Permutate" option. Accepted warrior types: stones, stone + imps, non-scanning vampires and any other bombers. Not allowed: scanner hybrids, stone + papers, paper hybrids. A stone is defined as a code that repeatedly attacks core locations at addresses calculated by add, sub or mul instructions. Evolved warriors are accepted if they run the code that fits the above definition of a stone. No clones. Submissions must differ from published tiny warriors in at least one key component such as stone, clear or imp launcher. All final entries will be published at the end of the tournament. The scoring is multiobjective. 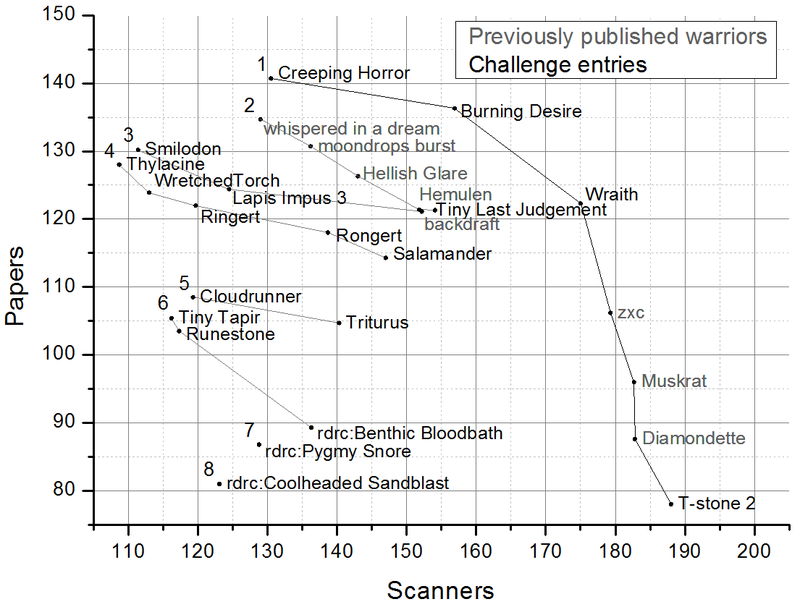 Entries will be benchmarked against two undisclosed testsets, first one consisting of scanners (mostly oneshots), and the second one consisting of papers, both handcoded and evolved. Ranking will be performed according to the Pareto optimality criterion. A dominates B if both scores of A are greater than the respective scores of B. Rank 1 will consist of non-dominated entries, rank 2 of non-dominated entries after excluding rank 1, and so on. Standings will be updated regularly. You can submit your entries to Reoser@Mail.ru at any time during the challenge period, but no more than one entry per day. A "day" starts and ends at 00:00 GMT. You can have no more than 3 warriors in the challenge at the same time. Include a ;kill line to replace an entry. Standings will be seeded with some of the published stone warriors. The challenge will last from April 6th till May 9th.